I posted a bit on Facebook about how I am currently test driving a Chevrolet Traverse as part of a huge Houston Blogger promotion that has been sponsored by the Houston Area Chevy Dealers! I am really enjoying my new ride (that only had 51 miles on it when I drove off with it. Can you BELIEVE that? Yikes! ), actually my whole family is having a blast in our Chevy! Disclosure: Chevy Girls on the Go is sponsored by Houston Area Chevy Dealers who gave 23 chosen bloggers a 2012 Chevy Traverse to test drive for two weeks. The dealers provided us with gas money and a spa gift card in return. 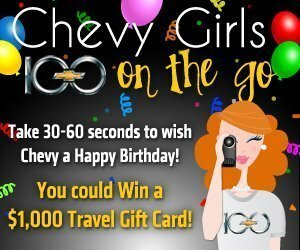 Follow the fun at theFacebook fan page or twitter at #chevygirls.